Note: This revision of the 1065 comes with a built-in heatsink for the driver chip to prevent it from overheating. The 1065 lets you control the direction, velocity and acceleration of one DC Motor. The motor is powered by an external power supply (9 to 28VDC). 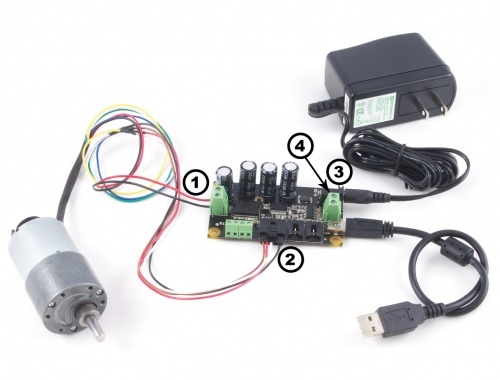 Brushed DC Motors are very simple to understand, but very difficult to control precisely. By applying a voltage, or pulsing a voltage rapidly, at the terminals of the motor, current flows through the motor, and it will begin rotating. Depending on the direction of the current, the motor will rotate clockwise or counterclockwise. The 1065 changes the effective voltage by changing the percentage of time the full supply voltage is applied to the motor. 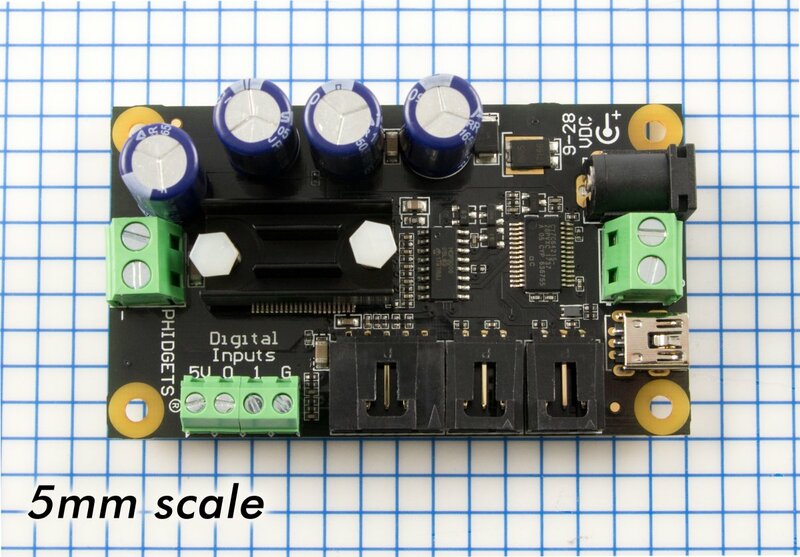 By switching the voltage very quickly (a technique called PWM), the controller is made smaller, more efficient, and cheaper. 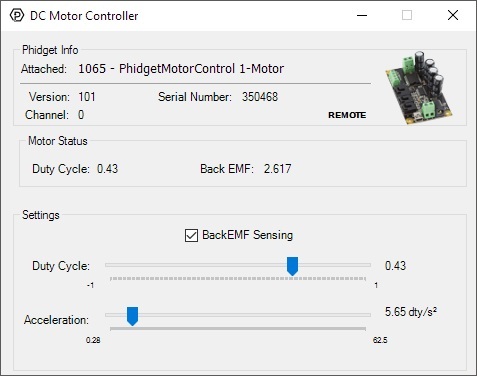 Rough control of actual motor speed can be achieved automatically in software by using the Back EMF property, or current sensing. 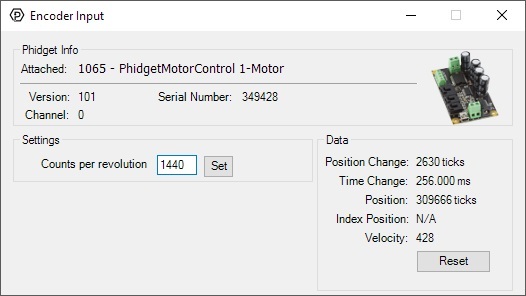 Precise control of DC motors can be achieved by using encoders. 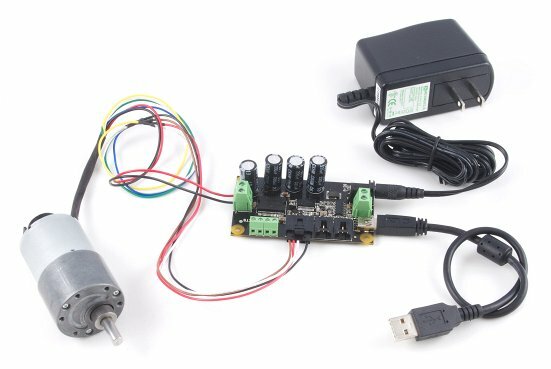 You can implement control loops through software by using the data provided by the on-board digital inputs, analog inputs and encoder input. 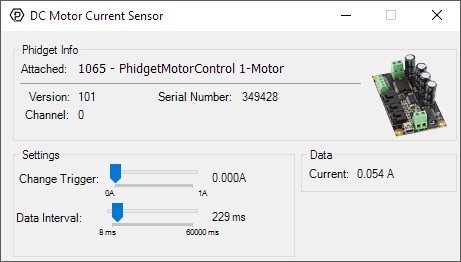 There is an event that triggers every 16 ms that returns the back-EMF value for the attached motor, which can be very useful for PID control. For more information, see the API in the User Guide. The 1065 also provides over-current, over-voltage, and over-temperature protection to insure that the board and motor is not damaged. We do not carry enclosures for the 1065, because motor controllers are prone to overheating when kept in enclosed spaces for extended periods of time with no airflow. We offer a wide variety of DC motors that can be used with this Phidget. Motors with higher gearbox ratios will have higher torque at the cost of lower speed. If you want a motor that has an encoder attached to it, skip ahead to the next table. These DC motors all have encoders attached to the rear shaft, allowing for closed-loop position control of your motor. These encoders will connect to the encoder input on the 1065 via the cable included with each motor. Linear actuators are simply DC motors that are hooked up to a linear screw which causes the shaft to move laterally instead of rotating. Unlike a rotary DC motor, linear actuators have a minimum and maximum position at which the shaft cannot contract or extend any further. On its own, the motor would not be smart enough to stop before attempting to push beyond these limits, possibly damaging the motor. That's why each linear actuator also has a built-in feedback potentiometer so you can monitor the position of the shaft and prevent the actuator from stalling out at its limits. The potentiometer can be read by the analog input on the 1065. 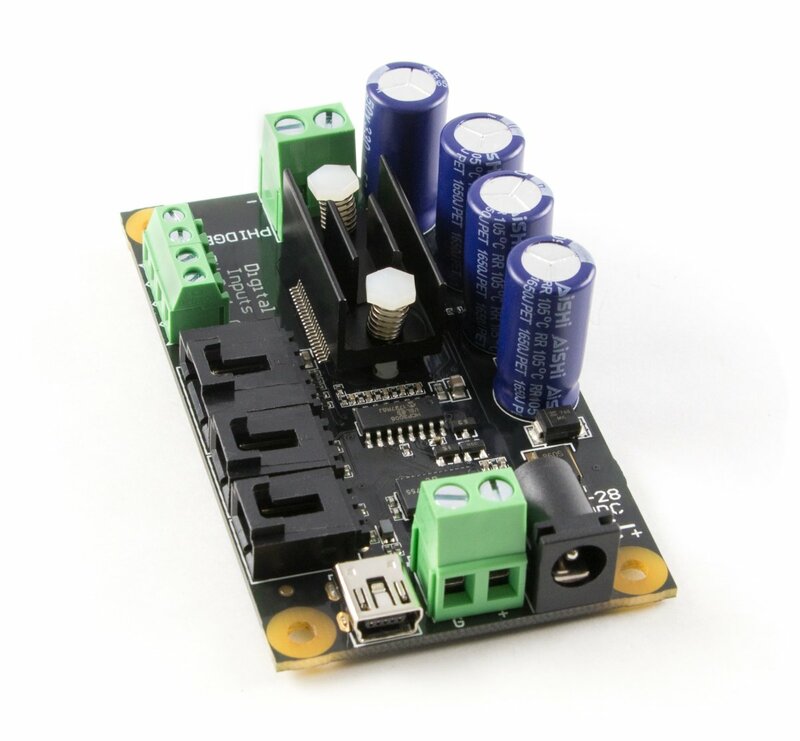 This Phidget requires a power supply between 9 and 28V DC. 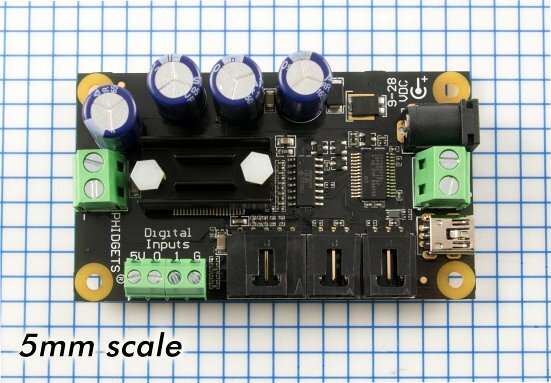 We recommend that you use a 12V DC power supply for smaller motors and a 24V supply for larger motors. Check your motor's specifications if you're not sure. 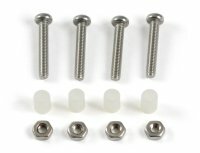 For best performance, you should get a 5 amp supply. Select the power supply from the list below that matches your region's wall socket type. Connect the positive wire (usually red) of the motor to the "+" terminal on the side of the Phidget opposite the USB port. Connect the negative wire (usually black) to the "-" terminal next to the red wire. Plug the DC power supply into the barrel jack, or if it doesn't have a jack, connect the loose leads to the "+" and "G" terminals between the barrel jack and USB port. Ensure that the DC power supply is plugged in. Now that you have everything together, let's start using the 1065! 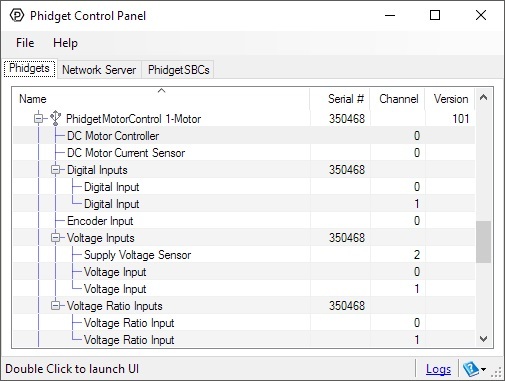 In order to demonstrate the functionality of the 1065, the Phidget Control Panel running on a Windows machine will be used. Linux users can follow the getting started with Linux guide and continue reading here for more information about the 1065. Toggle the BackEMF Sensing checkbox to enable/disable back-EMF sensing on the 1065. For more information on the analog inputs on the 1065, check the Analog Input Primer. For more information about encoders, check the Encoder Primer.